Zumba® Classes in Redhill, Sherwood and Mapperley. It’s advisable to book your first class online. Whilst attending your booked class you have the option of paying in advance for the following week with a reduction of £1.00. This option saves you money and guarantees a place. Customers that have paid in advance are given priority with any remaining spaces placed online. The payment has not already been transferred. The cancellation is received by text before 12.00 on the day of class. Online payments are non transferrable and non refundable. Spaces become available to book online 6 days in advance of the class until 12pm on the day of the class. 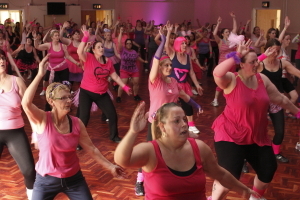 Please take a look at our useful information page if it’s your first visit to a Zumba® Class. ZUMBA® and the Zumba® Fitness logos are trademarks of Zumba® Fitness, LLC, used under license.